Pick Analysis: Ryan hopes to follow in the footsteps of his brother, Graham, who is a starting guard for the Detroit Lions as a rookie. He took a step in that direction by garnering second-team All-Big Ten notice and the team's Defensive Lineman of the Year in his final season (39 tackles, 9.5 for loss, four sacks). Glasgow was just happy to return to the field after missing the end of his junior year with a torn pectoral muscle (nine starts, 25 tackles, five for loss). He was a starter in 2014, as well (22 tackles, four for loss) following two years without much playing time (redshirted in 2012, two tackles in 11 games in 2013). 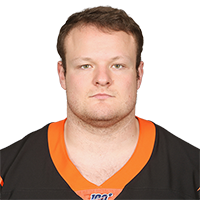 Published: April 29, 2017 at 01:53 p.m.
Former Bengals kicker Jim Breech announces the Cincinnati Bengals selection of Michigan defensive tackle Ryan Glasgow in Round 4 with the No. 138 overall pick in the 2017 NFL Draft. Published: March 30, 2017 at 06:24 p.m.
Michigan defensive tackle Ryan Glasgow goes through drills at the 2017 NFL Scouting Combine.